This is a mechanical hand drawn by my son Charles. Very nicely done. My daughter has a wooden hand on her desk for drawing. Got to hand it to him - that's great! I like it!! Very interesting, don't let him stop there he has great talent, it does show in that drawing. It's quite impressive. 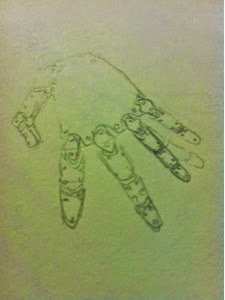 Drawing a hand is hard enough, let a lone a mechanical one. That's really cool. I love mechanical drawings. That would be cool to see it in an animation. Nice job! I would be happy, if I could draw a straight line. Happy #WW! very cool. I like it ... makes me think of C3-PO.